Officer Peggy Thusing Receives VNC Commendation! - Yo! Venice! 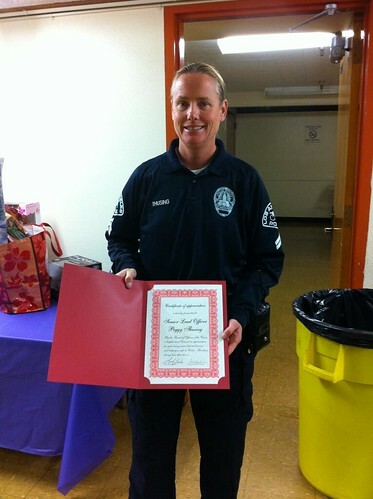 Home Venice Beach News Officer Peggy Thusing Receives VNC Commendation! Officer Peggy Thusing Receives VNC Commendation! Senior Lead Officer Peggy Thusing received a certificate of appreciation from the Board of Officers of the Venice Neighborhood Council this evening for her many years of dedicated service and helping to keep Venice safe for residents. The commendation was in part for apprehending a home invasion suspect within 24 hrs. The robbed home was that of one of the VNC board members. Thanks Officer Thusing! You rule!